Dan Doiron's Livin' Centre Stage is the next, and best chapter in his already impressive career! From the opening, funky, track "The Next Lifetime Around" through to the beautifully, heart-breaking closing track "The Letter", Livin' Centre Stage showcases his talents as a smooth vocalist, a searing guitarist, and a songwriter capable of shifting effortlessly from the humorous to the poignant. Dan Doiron is an old school rocker with plenty of new ideas. He's worked at his craft, developed his song writing and honed his own style over thousands of gigs. You can feel his life experience pour out of each track of his new album 'Livin' Centre Stage' on Earwig Music. Dan Doiron’s musical mastery have him Livin’ Centre Stage. And that’s also the title of his dynamic new cd. It’s electrified blues with lyrics that make you stop and think. But not for long, because Dan’s music gets your toes a tappin’ and you just wanna get your dancing shoes on and go boogie. "Every once in a while you stumble across a blues album that makes you wonder why you hadn’t come across the artist before. And with a title like ‘Stand Back I Don’t Know How Loud This Thing Gets’, Canadian blues rocker Dan Doiron isn’t holding back with his message. Stand Back I Don’t Know How Loud This Thing Gets is not an idle threat. It’s reality cause this is one hot, smoking album that sizzles with rockin’ blues. The album delivers its title with a vengeance under the expert guiding hand of Dan Doiron. Dan hails from down East where he’s well known as an accomplished musician. This is Dan’s third solo release and it not only features great guitar licks but also highlights Dan’s composing and lyrical skills. From the opening track of You Give Me Shivers, you know this album is going to take you on a musical journey with his blistering guitar leading the way. Take a listen to the title track and you know where the title Stand Back I Don’t Know How Loud This Thing Gets, especially when he sings“Stand Back this could get dangerous”. And that’s another point worth noting – his vocals blend seamlessly with his guitar to form a sophisticated, yet raw sound. One of the more remarkable songs on the cd is Killing Each Other Trying To Get Into Heaven. It’s a modern protest song that points at the ironies of present day. “What if we all decided to just get along?” is the plea that resonates through the tune, framed by Dan’s shrieking guitar. It is one powerful song you have to listen to over and over again. And then there’s Dance Naked. Need I say more? This entire cd is packed with great tunes, great guitar work and great vocals. And oh yeah, great lyrics. Dan Doiron merits serious attention. Cape Breton’s Dan Doiron is justifiably proud of his new, third disc. A stunning production, with an attractive cover and a video all in the service of some very good songs. Doiron is a fine singer and an excellent guitarist, making this one well worth your attention. Now based in Halifax, he has assembled many of its finest players for a program of horn band blues & R&B.The rocking “You Give Me Shivers” is a fine opener: behind his vocal we get his guitar, Kim Dunn’s organ, Keith Doiron’s bass & Mike Carroll’s drums along with fine horn section and back up singers, all beautifully recorded. “My Kind of Trouble” is another fine rocker with some excellent drumming, the story of a very lucky man. The horns sit this one out. Things slow down only a little for “Killing Each Other To Get To Heaven”, Doiron’s well-written commentary on world affairs. What if we are never taught how to hate? This is the video, at www.dandoiron. com and at youTube. The title song is another highlight, as he sings of the power of his guitar as a weapon of change. “Don’t You Know Who I Think I Am?” shows he also has a fine sense of humour. “Painted Up” features fellow Cape Breton guitarist John Campbelljohn on slide on a light-hearted, funky tale of his trip to Memphis for the Blues Challenge. (There’s getting to be quite a list of these!). “Tango Girl” is the only slow blues but it’s a fine one about the stripper he loves. The trip south also provided the inspiration for “One And For All” with it’s references to crossroads and the devil. The web site doesn’t have any shows outside of Nova Scotia at the moment, but the CD is available for streaming and purchase at his web site and at iTunes. This is album number three for the Cape Breton blues guitarist, the previous two landing nominations for ECMA blues recording of the year, and this should join the pack for 2016. Stand Back is full of big tunes, and a big sound, with organ, backing singers, horns, and even a flute solo, a damn good one at that. Plus, there's lots of Doiron's licks, bites, stings and leads. Originals such as Killing Each Other Trying To Get Into Heaven are filled with such fireworks, and when Doiron isn't spitting them out, up comes Kim Dunn's organ, or a sting from the horns. Doiron's also a highly enjoyable lyricist, and never fails to come up with a fine line or two, and a good song premise. The title cut has classic blues swagger, and "When you're swinging by six strings with no safety net, that's affirmation up and down the frets." He can even reframe cliches into something unique and his own: "If time is money, then I blew a fortune/oh that may sound funny but it's not a distortion." There's always lots going on in each song, and it's all worth listening to. But really, check out that flute/guitar interplay between Doiron and Brian McConnell on Slippin' Back Into The Dip, that's a winner right there. Dan's from Cape Breton, which was first port of call for my Auntie Alice when she emigrated back in the fifties, so we’re practically family. But I won’t let that sway me. It’s not pure blues as he likes to veer into soul and rock, but it’s impeccably performed and very enjoyable. It’s his third album and a well arranged one, with some excellent organ work augmenting the sound, leading to a fuller, richer experience. The best of the songs include ‘Killing Each Other Trying To Get Into Heaven’ and ‘Don’t You Know Who I Think I Am’, the titles of which should warn you that he also has a way with words. Cape Breton bluesman Doiron stepped out as a solo recording artist in 2011, and immediately joined the top tier of regional blues players, gaining an ECMA nod for this debut, Even My Guitar Is In Love With You. The follow-up is a confident, smokin' set full of hot leads, a variety of styles, and best of all, lots of cliche-free originals. Doiron plays it full of energy, moving in and out of funk, rock, and scorching blues ballads. Never afraid to let it rip, even the slowest-tempo numbers (Am I Blue Enough), have some fireball solos on top. Using the basic guitar, bass, drums, and organ (the mighty Kim Dunn) set-up, the quartet shines on the funky stuff, everybody locked in on the opener, At The Hard Knocks Cafe, bassist Keith Doiron and drummer Mike Carroll keeping the rhythm popping, setting up the guitar and organ solos. The title cut is a sinister cut, lots of nasty tone out of Doiron's guitar, the rest of the band in rock-riff mode. When they bring it down for a quiet verse, Doiron's voice really shines, he has the passion. What grabs me most are the lyrics, usually the weak point in most electric blues albums. Doiron has lots of original, good ideas for songs, and even when they are the old boy-girl tunes, he uses different language, lines that you haven't heard a dozen times. At The Hard Knocks Cafe is about playing rip-off joints, where the owners are making threats and demands. What I Did Then is a clever number about living with past sins, remembering all the dumb things done in younger days ("Wasted time trying to be a rock star/Sold my '58 Strat guitar"). What Did You Expect is a slow, soulful number, with some advice to a guy who won't compromise ("Can't hear the answer when you're beating your chest"). Great playing always sounds even better when the words are worth hearing, too. Dan Doiron is an excellent guitarist. His latest release, From Deep Inside, draws to mind the guitar playing of David Gilmour, Eric Clapton and Glenn Frey. From the opening riff of "At The Hard Knocks Cafe", the first song on the new album, you know you are in for one hell of a musical ride. With a band consisting of Mike Carroll (Drums), Keith Doiron (Bass) and the amazing Kim Dunn (Organ), Doiron leads you through this musical ride masterfully. Doiron started his first band in Port Hood, Cape Breton at the age of 13. Since those early days, when he would travel everywhere with a guitar strapped to his back, Doiron has completed a music degree from Dalhousie University and has become an established musician, music educator, guitar clinician and recording engineer. In 2011, Doiron released his debut album, Even My Guitar is in Love With You, which was nominated for both a Music Nova Scotia Award and East Coast Music Award for 2012 Blues album of the year. From Deep Inside starts with a couple of songs that showcase Doiron's exceptional up-tempo guitar playing ("At The Hard Knocks Cafe" and "From Deep Inside"). "What I Did Then" and "Still" are other songs on the album in that vein. These songs also allow the bands' playing to shine. "Let's Get Into It", took me (wonderfully) back to 1980's Glenn Frey; and ""What Did You Expect" called to mind some early Eric Clapton solo material. Even though I enjoyed the up-tempo songs, my favourite moments listening to From Deep Inside came when Doiron slowed things down a little. Songs like "Too Good To Me", "Misunderstood", "Am I Blue Enough" and my favourite song on the album "Last Chapter" allowed me to close my eyes, sit back, and feel the music. If you have ever listened to David Gilmour's solo recordings (especially his 1978 self-titled album), you will know what I am talking about. The guitar playing on these songs take the listener to another place. It is a magical experience. The CD is a superbly recorded and produced says Atlantic Seabreeze. The song writings are great and the music is excellent. A great listening CD and while listening to this album one can really notice how well produced this album is and the listener cannot stop playing the CD over and over again. AtlanticSeabreeze gives this album 5 stars out of 5 stars on its rating list.
" Dan Doiron's new release, "From Deep Inside", is a superbly recorded and produced CD. I am impressed with the sound of this record. This CD is excellent on a number of fronts. The song writing is strong. Musically, there are plenty of great hooks delivered by veteran musicians who fully understand Dan's creativity. Play it loud and enjoy this thoroughly excellent CD." 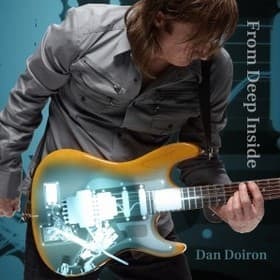 Hey if you're like me and love the sound of a screaming guitar, you've got to get your hands on Dan Doiron's latest CD,"From Deep Inside"!!!! It has those crazy guitar riffs that keep you waiting for the next one. There are great vocals on every track.
. What about the standard rock ballad, you ask?? It's there too, Dan's smooth vocals on this one are fantastic!! What ever you're supposed to be saving that money for, no worries, GET THIS CD INSTEAD, you'll be glad you did! !